20 to 40% discount: rare Psidiums, Guabiju, Jaboticaba, rare Eugenias, etc. Just potted all my Psidium's up. Have had amazing germination. A lot of things germinated within a month and within the next month, most of the seeds that hadn't germinated began germinating. I'd say I had 75-100% germination on the seeds. Thank you Marcos! I have a few sete capotes (C. guazomifolia) now! * NEW Arazá johvy (Psidium aff . australe (Helton) or aff. guineense (Landrum)). Fruits ripe in yellowish green, 4cm long, 3.5cm diameter, taste like pear mixed with raspberry. * Psidium ROBUSTUM, Very rare psidium, it tastes very good, acid and sweet, similar to a mix of pineapple/apple/strawberry guava. Hardy to -3 or -4º C and to 6 months of drought. * Araçá morango (psidium guineense), harvest April 2018. Acid and sweet like strawberries, hardy to -5º C, it start producing at 1 year and 6 months after sowing. * Araçá-una / black arazá or purple forest guava (psidium myrtoides), harvest feb/march 2018. * Lemon guava (psidium cattleianum var lucidum), very nice lemon flavour, not acid, sweet. * Tropical guava (psidium guajava) frost hardy to -4.4º C, sweet. It fell to the ground unripe but it is turning yellow, so I think it will be ripe in 2 days. The nice thing about it is that it will be no damaged by the fruit fly. The plant withstood frost of -3º C without so many problems (only some leaves changed color), it is more resistant than P. myrtoides, which lost half of the leaves and suffered burns on the upper branches. Interesting offer. I believe all these will fruit in tropical climate in Kerala, India. For Offer pack of USD 65, how many seeds will be there. Following your reply, I will confirm order. I have some very rare cephalotaxus fortunei seeds on sale now. 10 seeds USD 18, and Araucaria araucana (seeds are very tasty when roasted! ), 10 seeds USD 12. * NEW Arazá johvy (Psidium aff . australe (Helton) or aff. guineense (Landrum)). Fruits ripe in yellowish green, 4cm long, 3.5cm diameter, taste like pear mixed with raspberry, it has a lot of very small 2mm seeds (similar to Psidium cattleyanum var lucidum). Very rare psidium; the guaraníes call it "arazá johvy", what means "blue guava". (new) * SPROUTED! black Eugenia Repanda Climate: tropical and subtropical: I have only 40 sprouted seeds. I have a very rare variety: ripe fruits are almost black! Normally, eugenia repanda use to be red. * big feijoa (acca sellowiana) , frost hardy to -12º C, very nice variety, sweet and tasty similar to banana but juicy and refreshing. Climate: subtropical and temperate. * SPROUTED GUABIJU / GUAVIYU: myrcianthes pungens. This variety is early bearing (4 years old) Climate: subtropical and temperate. Fruit is sweet and not acid, very nice. 24º Brix! Frost resistance of guaviyú: -9 or -10º C (similar to feijoa -acca sellowiana-). It bears at 4 years old. 3 to 4cm diameter, rough skin pear shaped fruits, The perfume of the flowers is one of the best I know (along with citrus flowers and sete capotes), good for mermelades, icecreams, jams, etc. For dry seeds it could be cheaper, but wet seeds and/or big seeds as for instance cupuazu, garcinia, etc. are just heavier. Psidium pack, USD 55, special offer; some of the last seeds of the rare ones! * Very rare ORANGE Eugenia aff. involucrata (or Eugenia sp. ); taste is sweeter and less acid than Eugenia involucrata, very good. I will have just a few by the next week, if you want to buy some, just PM me and I will and you to the waiting list. Re: Selling: rare ORGANGE Eugenia sp., black E. involucrata, big pitanga, etc.! Re: Selling: RARE Orange Eugenia sp., black E. involucrata, big pitanga, etc.! I will have more from the black Eugenia involucrata and the Orange one too. Hi, I am adding this species! 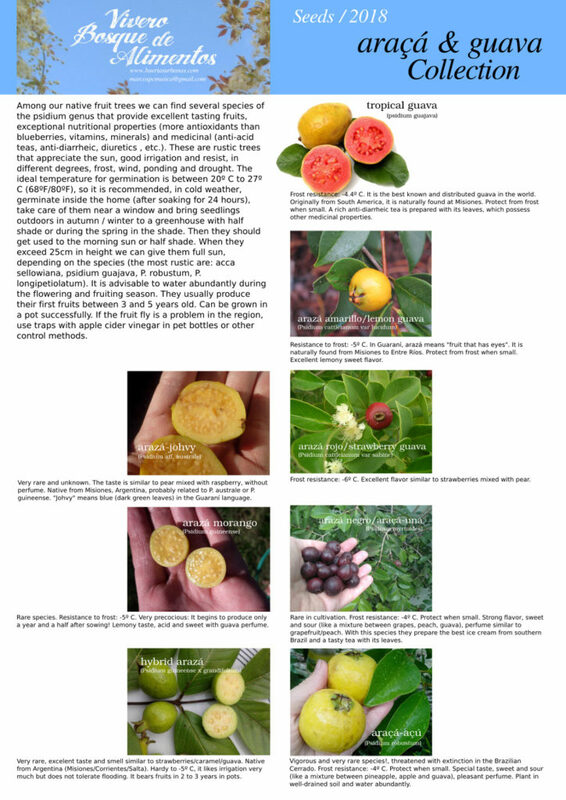 Re: Selling: RARE Orange Eugenia sp., black E. involucrata, jaboticaba!, etc.! I traveled 600 Km just to get them! Amazing flavor. I have the orange Eugenia sp. from Posadas in my hands too :-); taste is very good but not like Cherry of the rio grande (and not a cherry taste), to me this is another species; it tastes more like apricot but with tones of mango, orange, pitanga and uvaia.